Make magic with moving water! With water effects you can add to the peace and tranquility of your poolside experience a number of ways? More economically than ever before. Plus, water effects allow your pool to sparkle with its own personality. There are so many way to create your custom water feature from Deck Jets to Laminars, Waterfalls to Dry Ponds or just build that dream design that you have always been thinking of. 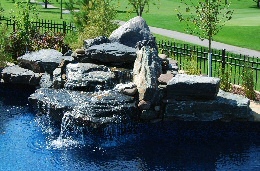 Poolscapes can create it for you with Craftsmanship that will last for years. Fiberstars Large Laminar Flow Fountain comes with 20&apos; or 40&apos; of fiber preattached. These beautiful Laminars are perfect for night time viewing either individually or in multiple arrangements. It includes a Light Enhancement Device (built in), which is a fully adjustable device for increasing the light output in the water flow. The fiber and laminar are produced together for an optimum light output. For best lighting results, keep the water throw under 6&apos; up and 6&apos; out, for best lighting output you should aim these at the viewing area. These unique Fiber Lit Sheer WaterFalls come complete with fiber pre-attached. Fiberstars Lighted Sheer Waterfalls adds dramatic nighttime excitement that is breathtaking. The Sheer Waterfall is available in five different sizes. Our Lighted Sheer Waterfalls requires the least amount of fiber for the maximum amount of light output. Each one comes with 45&apos; of pre-attached fiber. 5-8 GPM per foot. All of your water features can be tied in directly into your main controller allowing for complete control over your backyard waterscape. Depending upon the controller you decide on, you may be able to access your controller via remote control. Deck Jet water effects can be cast into concrete decks and gunite pool walls, mounted in the sidewall of aboveground and vinyl-lined pools, or blended into surrounding landscapes. The Deck Jet creates a graceful arc of water that enters the pool with a gentle splash. The stream seems to appear magically from the pool deck since the jet installs flush and out of sight.